10 Lessons From Gluten-Free on a Shoestring Bakes Bread | Great gluten free recipes for every occasion. Introducing the Gluten Free Bread Revolution! 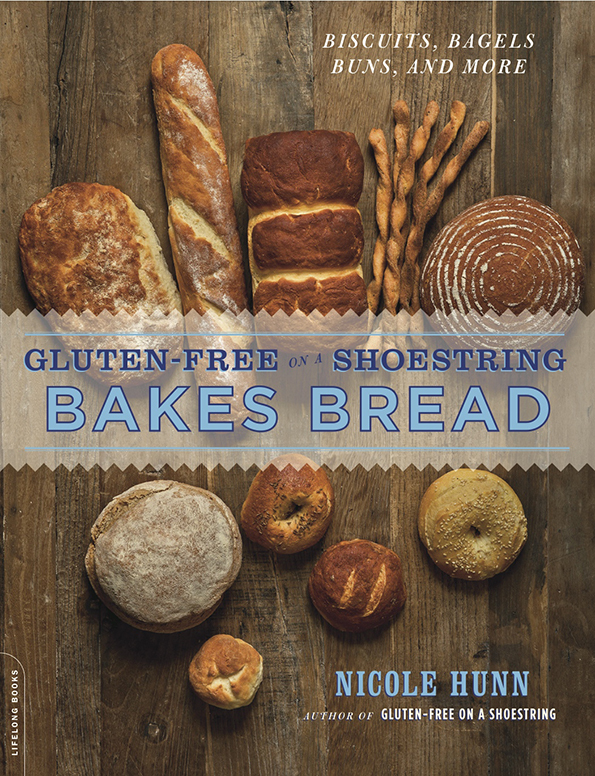 My next cookbook, Gluten-Free on a Shoestring Bakes Bread, is coming this November. It’s going to change things a lot. It’s going to raise the bar. It’s going to knock your gluten-free socks off! Everything I have done in the kitchen since I started baking gluten-free nearly 10 years ago has been leading up to this book, this bread, these methods. My heart is racing thinking about getting it out into the world. There will be a whole lotta hoopla over the next few months designed to get you as excited as I am about this book. Plus, scroll down for the 10 Lessons About Gluten-Free Bread That I Can Share Right Now. And be sure to leave a Comment Below asking your questions about the book (what recipes are in there? what equipment will I need? what is a pure levain sourdough and how is it made? They’re all fair questions, and I will do my best to answer). 1. You’ll get it as soon as it’s ready to ship—often even before it says “In Stock” on amazon. You’ll probably even get it considerably before the “on-sale” date of November 26, which is a date 2 weeks after my publisher ships the books from its warehouse. It is designed by the industry to give retailers time to unpack the boxes and get the books on the shelves. Online retailers like amazon need less time for all that jazz, so they ship faster. 2. Book retailers won’t run out of stock! Healthy pre-order sales ensure that no one runs out of stock after publication. Tell my publisher that you’re excited for the book! Then they won’t be caught out—and neither will you. This is one of the only ways to influence stock. I have way, way less control than most readers assume (read: I have, like, no control). 4. Win free stuff … from me directly! Over the next few months, there will contests and giveaways here on the blog. Pre-order now and you’ll be eligible to win all kinds of cool free gluten free bread stuff later. Everything from signed copies of the book from me to you all the way up to a grand prize of a baker’s dozen worth of my favorite cooking essentials and kitchen tools (details in the coming weeks). Right after we wrapped the photo shoot for the new book, baking my way through a total of 75 pounds of gluten free flour in 4 weeks’ time, I sat down and wrote this list. While I can’t show you everything in the book just yet (although there will, of course, be a preview recipe or two on the blog closer to the big day), I can tell you these 10 things that I think you should know right now about gluten free bread right now. You should be able to incorporate these tips into your mindset and into your bread-baking now, and even more so once you have this cookbook in your hands. 1. Start wet. Then add flour on the outside to make it dry. That way you can manipulate the dough without getting that dreaded tight crumb in your finished bread. Just be sure you use a light touch when handling the dough. And with my new methods & recipes for baking gluten-free bread that you will learn all about in the new book, there will be no weepy, sad mounds of gluten-free bread dough that simply don’t resemble bread dough as anyone before has ever known it. See? I told you that everything was going to change. 2. Cold (refrigerator) bulk fermentation is the way to go. Especially when you’re working with a gluten free bread that doesn’t have too many enrichments (like eggs and butter), a long, slow rise in the refrigerator will not only make your life easier (no waiting around for the dough to achieve its first rise! ), but it will make the bread more flavorful (from slow yeast development) and easier to handle. Yeast is still active at refrigerator temperatures. It’s just slower. And as the dough rises in the refrigerator, it absorbs more and more of the moisture in the dough. So the bread dough (and ultimately the bread) is still moist, but it doesn’t feel as much like it as you handle it. 3. Don’t expect more of your gluten free bread than you would of conventional bread. Just like in conventional bread baking, if you try to cram too much nutrition into your gluten free bread, it’s harder to have a successful recipe. So if you’re tempted to swap out flours, expect that it will throw things off and that the dough will be more difficult to handle. I have plenty of recipes for hearty gluten free bread in the new book. But none of them is 100% whole grain, and that’s a good thing. It’s your bread, not your vegetables. 4. It’s different, but not that different. With my new method and recipes, gluten free bread dough can get so so soclose to conventional bread dough. So close. But it will still be a bit different. That difference doesn’t have to be bad. Baking gluten free bread should still be pleasurable. And it will be. Just you wait. 5. Flours matter a lot. Gluten free flour blends that are super high in starch absorb tons more moisture and struggle to brown in the oven. They make for a dough that is relatively easy to handle, but the bread itself will disappoint you. Or it should. If it doesn’t disappoint you, then you’re expecting too little from gluten free bread. 6. Baking bread is super environmentally sensitive. The same recipe that I’ve tested upwards of 50 times will work one way in the cold, dry winter and another way in the warm, steamy summertime. In every recipe, I begin with a stable amount of liquid, and then add flour for balance. It is easier to tighten up a dough than to loosen it. Fact. 7. A stand mixer really helps, but there are options. It isn’t impossible without one, but it sure makes things easier. And, since the recipes in the new book are intended to make bread that is smooth and taut on top (look at the book cover! ), you need a mixer to knead the dough until it’s smooth and elastic. But good news! I did some research, and there’s hope yet if you don’t have and don’t plan to get a stand mixer. The KitchenAid 5-speed hand mixer with the dough hooks attached can get the job done. Woohoo! 8. We can have it all. Everything from focaccia bread with big, yeasty holes that’s crispy on the outside and pillowy on the inside to bagels that hold their shape, yeasted donuts that rise straight up instead of out and pure levain sourdough bread that rises high as the sky, all without any commercial yeast. We can have it ALL (well, as soon as the book comes out we can have it all). 9. Dairy-free is, indeed, harder than gluten-free. But there are work-arounds. Milk protein behaves most similarly to gluten (a protein) in baking. Soy has a similar structure, but behaves very, very differently in baking. Don’t worry, though. I’ve got tricks up my sleeve for my dairy-free friends. 10. This book really needed to be written. I don’t mean that I was the only one in the world who could write it. Far from it. I’m honored to be able to do it, but mostly someone just needed to put in the work and get it done. A really really good book of artisan gluten free bread recipes was seriously lacking in the marketplace. And once I committed to writing it, there was no room for excuses. Nothing less than ah-mazing was acceptable. I have never worked so hard in my entire life, but it has never been so, so worth it. P.S. 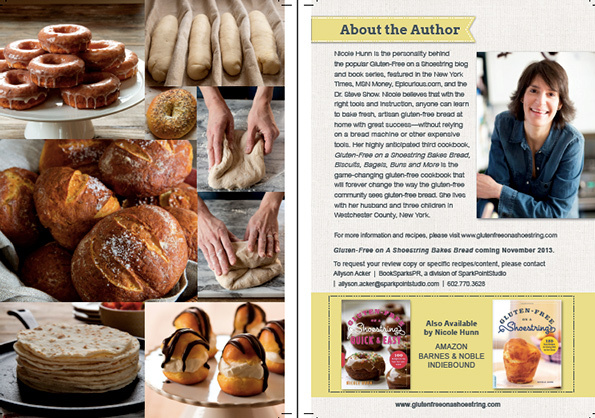 If you’ve haven’t pre-ordered Gluten-Free on a Shoestring Bakes Bread yet, what are you waiting for?! Time’s ticking! Can I use a Cuisinart Food Processor to mix the dough? I do not have a stand mixer. Thanks. I’m afraid not. I discuss in the book using a 5-speed KitchenAid hand mixer with the dough hooks, though. Nicole, I just got a Cuisinart stand mixer which came with a spiral bread hook, a flat mixing paddle and a whisk. Which one should I mix my GF bread dough? Nicole, On Sunday morning, I made real, doughy, yeasty cinnamon rolls for the first time in years. I have Challah dough in the fridge now (rising for the last several days) and tonight, I will roll and shape actual bread dough and I will tell the bread the shape I want it to take, as opposed to it laughing at me and choosing a form of its own. I cannot believe you found the answer to mimicking gluten protein with the whey isolate. Your book hasn’t left my coffee table since I bought it. I make notes in the margins, and make small tweaks for my oven,and it’s covered in flour. I am so wonderfully impressed, and cannot thank you enough for all of the hard work you put into this. What a joy. There will be bread! I have tried 3 batches of your wonderbread;). I feel like I am doing everything correctly but getting poor results. This last batch today I let rise 4 hours until I saw no more progress in a specially heated room. I just comes out so dense. My yeast is fresh. I do notice when I get dough from fridge it is very cold and doesn’t fold well could my fridge be too cold and I know I’m not overworking it for sure maybe under working it? It’s 36 degrees. Mary, I recommend that you read the Bread FAQs page. I think your answer is probably in there! I recently got your bread book (after reading about it in a gf magazine) & I am soooo excited!! I was a big baker prior to learning I had to be gf (& my son also), I do make home made gf bread on a very regular basis, but none of it is satisfactory IMO. I have my first loaf slow rising in the fridge now. My son & husband are dairy free, so I’m using the pea protein. Do I still fold it over & then shape it as directed in the recipe when I’m doing it dairy free?? Hi, Diane, Please see this newer post on the blog. Read the earliest comments on the post (at the bottom of the comments). I discuss the dairy free dough there. It isn’t the same, I’m afraid. You’ll need to shape it with wet hands, but the results will be similar! Thank you for responding so quickly! I clicked on the link you provided but I can’t find info about what to do after the first rise in the refrigerator when it’s dairy free. Oh now I found it! Thanks again!! I mean crisp on outside but gooey/uncooked dough on inside. I made your GF poptarts and after baking they remained gooey (almost uncooked-dough) on inside, but crisp on inside. Is there a special type of jam I’m supposed to use? I used an organic seedless jelly. Hello Nicole! I ordered your book last week and finally received the last of the ingredients. I made up the dough for the focaccia and it is in the frig now. However, the dough is really more like pancake batter. Should I add more flour now, or wait until it has been in the frig for a few days? I know there is NO way I would be able to shape the dough at this point. And when I add flour, should I use the all purpose blend, or the bread flour blend, since it is SO wet? Thanks, and I’m looking forward to trying the other recipes!! Second, please be sure that you measured your ingredients properly by weight, and that you mixed the dough with the dough hook until “a trail of dough from the hook to the bowl [is] intact for at least the count of five.” Otherwise, you have not worked the dough enough with the mixer hook. All authentic gluten-containing focaccia dough has a very high hydration, so it is a very, very wet dough. It is not, however, pourable like pancake batter. It is not wet because it’s gluten free dough, Angie. It is wet because real focaccia is a very, very high hydration dough (80% hydration – 100% hydration would be as much water as flour). Follow the directions on baking day and sprinkle flour liberally, but resist the urge to add more with your mixer. And the olive oil you use to shape it will assist you in spreading it on a baking pan. Basically, the wetter you can keep it, the bigger the holes will be when you finally bake it. You will not be kneading this by hand in a traditional sense – only scrape and fold, and not a ton of that, even. Have fun! Hi, Dawn, there will be! It just isn’t up for pre-order just yet. But it will 100% for sure be available (in fact I’m reviewing the digital version of the book today!) and should be by publication date (12/10). Thank you somuch for spending the time to put this book together! We just learned about a month ago that our 2 1/2 year old is gluten-intolerant… so I’ve been spending all of my free time (after working a full day outside the home) scouring the internet trying to learn about GF baking… I just pre-ordered your book on amazon and I can’t wait for it to come in the mail!!! I do have a question though, when my dough rises beautifully and bakes nicely, but then falls when I take it out of the oven, what am I doing wrong? Granted, this wasn’t your recipe (as I just found your blog this week) but I’m curious “in theory” what you opinion would be? Generally, Stephanie, bread that rises well and then sinks (and I talk about this in the Troubleshooting section of the new bread book) is due to a too-hot oven. It bakes the outside of the bread too quickly, long before the inside has the structure necessary to support the rise. As it cools, the hot air seeps out and the bread falls. Hi – I really want your book! We have just been told our son can’t eat almond or coconut flours (any salicylates), and most gf books are full of them at the moment, does yours have a good selection without these things? Also, are there a few I can use in a bread maker? Our kids are always hungry and I can’t keep up! Hi, Louise, there is no almond or coconut flour at all in this cookbook. This is not a bread machine book, though. I do not use or recommend use of a bread machine. I find that they differ considerably from brand to brand, making universal instructions a near-impossibility, and make an odd-shaped loaf. Hi Nicole, Thanks for all your good work in the kitchen, on line and in print. Are there recipes in your new book that do not contain potato starch and/or potato flour? For your recipes that do contain potato starch and/or potato flour, have you tested or can you recommend substitutes? Thanks! PS In most other GF/dairy-free recipes, I have excellent success substituting tapioca starch or arrowroot powder for potato starch (depending on the balance of other ingredients), but I’m stumped when it comes to potato flour. Will there be any bread recipes in your book that don’t contain xanthum gum & yeast. And can I sub coconut milk for milk? I live in New Zealand where can I get your books from?? I have been diagnosed with celiac disease for seven years now but I’m tired of spending all my money on food I don’t really like. I used to bake all the time with regular all purpose flour then when gluten free came into the picture it was not so fun anymore and highly expensive just to do trial foods. My mom showed me Cup 4 Cup gluten free flour from Williams and sonoma, and it’s good it’s just so dense, it tastes better than when i have to mix everything but I wanted to know how to get a little bit fluffier bread that can still rise and not turn out like a brick… any suggestions? Should I use xantham gum or carbonated water? I just don’t know what would help, if anything? Does Lesson #2 mean that you don’t use a “proofing chamber” anymore to raise bread? I just bought your first book (waiting on the new one too) and I am going to start baking from it tonight! Do you recommend raising those breads in the fridge? Thanks so much for writing this. I’m just starting to go Gluten-free and I have two of your books on my Kindle. I was looking forward to adding this to my Kindle, too, but went ahead and ordered the physical version just now when I saw the chance to win free stuff! :) Great thing is, Amazon doesn’t charge you til they ship it. And also, I discovered another benefit to ordering now. #6. Adding a pre-order of Bakes Bread to your cart that is under the limit will qualify your order for free Super Saver Shipping. Doesn’t matter if it doesn’t ship til December or whenever. Thanks so much for this blog, your books, and the upcoming giveaways. will there be many options for making the recipes MSPI as well as GF? My son is Milk/Soy Protein Intolerant and w/my daughter & I needing GF – I am sick of making 3 different versions of everything! I thank God for you, your VERY GENEROUS blog & your talents every single day! The yeast bread recipes are not dairy free, as the flour that I use as a “gluten free bread flour” contains dairy. However, I offer recommendations of the best dairy-free substitutes to use, after considerable experimentation. The dairy-free substitutes are soy-free (and off the top of my head, I can’t think of any of recipes that rely upon soy). I know you suggest we don’t double the batch, but can we half the recipe or freeze the dough? I do not recommend freezing unbaked yeast dough, Scarlett. Sometimes the yeast is fully active when it defrosts, and sometimes it is not. I should have also asked which book applies to the yeast breads/pizza dough? Which book would have the pizza dough and bread recipes? Pancakes & waffles in another? Not sure which one to buy to get the pizza & bread recipes in particular. Secondary would be the breakfast items. Since I do not need to worry about dairy/egg free, are most of your recipes dairy & egg free? Thank you so much in advance for your response. I really enjoyed your website – a wealth of information! I would recommend you use the “Look Inside” feature on amazon.com, Cheryl for both of my existing books. You will be able to see the entire table of contents for both books there. Anxiously wating for this book to be out. I have both your other books and have not had a failed recipe yet as I have had with other GF cookbooks. Your way of writing is also very encouraging too. It makes it easier to transition from never making anything from scratch to having to make Everything from scratch to suit the special diet needs of my kids. Thanks for making things easier! Thanks so much for the kind note, Dee Dee. I’m so glad you have found my books useful and encouraging. Encouraging readers is something I consider to be my number 1 job! Oops!! I left a comment elsewhere, but just saw this thread!! So, my questions are whether you have sourdough recipes in your new bread book and if you have instructions on creating a Wild Yeast sourdough starter? Thanks so much for your blog, your books and your incredible way of communicating such intense information!! You make it easy and fun and non-overwhelming! And you’rereally funny to boot!! I wish you had had this blog and books when my mom was diagnosed with refractory-celiac disease some 13 years ago. She has since passed away (last August)– she would have loved it!! Can’t wait for your book!! Great initiative and best of luck to you for your new book. Question: many recipes I find, contain Xanthan Gum, Guar Gum or things like Tartar ‘something’, all things that are not sold in my country and I have not been able to find anywhere else. Do recipes in your new book depend on those ingredients aswell or do you provide bread recipes without the above? Furthermore I’d like to know if any other top allergens are used. I read about eggs, but what about soy, dairy, peanuts, treenuts and stuff like that? As I namely cook and bake free of all top 14 (in Europe at least) ingredients I am curious as to what to expect in your new book. Do wish you all the best! I am convinced it will be so helpful for so many. Yes, my recipes do require some xanthan gum, and sometimes cream of tartar, if that is what you are referring to. My recipes are only decidedly gluten free, not free of all top allergens. I give directions for how to convert the recipes to dairy-free. Cream of tartar can be found in the spices area, for some reason. It is sometimes called potassium bitartrate. It is probably available in your country under a different name. Other than a recipe for Oatmeal Bread in the new book, I don’t recall any recipes that call for gluten free oats. You should be good to go! Your book sounds fantastic! Do many of your recipes in your various cookbooks have oats in them? We cannot tolerate even GF oats, perhaps because the storage protein in oats, avenue, is similar to the storage protein in wheat. PS: I have co-authored a free layman’s Guide for Gluten Free Living with a whole variety of information on Celiac and living gluten, incl. diagnosis and symptomology. People can get it by e-mailing gfingp at yahoo dot ca (hope you don’t mind me saying that). Your website is listed as a good resource. Is there a bread recipe that contains uses seeds in the recipes? My little guy loved multigrain bread before he needed to be GF. I have tried a recipe that used sesame seeds, sunflower seeds, and flax seeds – while I loved the crunch the bread tasted sour. Hi, Nanny, yes there are recipes in the book that contain seeds, and whole grain recipes to which you can easily add seeds. Hi Nicole. I preordered your new cookbook on Amazon as well as your first 2 books. I was only recently diagnosed & it has been a difficult adjustment. But I am a seasoned cook & baker so once the shock wore off I am now embracing the challenge. There are hundreds of gf blogs online. But I only follow 3 faithfully: yours, Gluten free Carla, & GF Girl & the Chef. The recipes are reliable, yummy, & normal. Thank you for helping me to not only make delicious foods again but doing it with a reasonable cost! Many hugs to you!! Hi, Cindy, Thank you so much for your support and the kind words. The first weeks and months after diagnosis can be quite difficult as the learning curve is steep, but thankfully it’s over rather quickly. It sounds like you really have your footing, and it will only get better from here! I do not bake with psyllium husk. It does not create the texture that I was determined to create in the recipes in my new book, at least not in my experience, and especially in the dough stage, as it requires a significant amount of liquid. If you have found something that works for you, though, by all means keep it going! I am fairly new to Gluten Free but your 2 cookbooks are my go-to books. They are clear and practical. I can’t wait for your bread book. I haven’t done a lot of baking yet as I’m a little skeptical because everything I have purchased GF premade has been a disappointment and expensive. My goal is to make GF breads that don’t crumble. Will you have pizza dough in your new book? I know it’s in your other cookbook but I haven’t had the courage to make it yet. Thanks for providing us with a wonderful website, it’s one of my favorites! You bet there will be pizza dough in the new book! A few different types, actually. And nothing at all will be crumbly! That is completely unacceptable in gluten free bread. We have come so far in the last few years, and this book will hopefully take things to another level. Cheers to never accepting crumbly bread! Are any of the breads yeast free? My son has multiple food allergies. Will preorder if there is only one great one .. I’m desperate! AND a fan of your blog. I’m so excited about this book! Congrats on seeing all your hard work come together, and know that this book will revolutionize gf bread baking for so many of us. We love you.